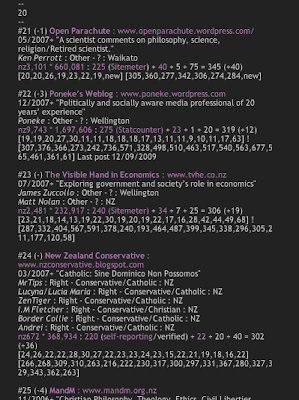 NZ blogosphere August 2009 survey has been released. 219 blogs in all are monitored. 'You'll never need maths once you leave school...' - Yeah, right. #5 Red Alert: Labour MPs - group blog: Mallard, Curran et al. #10 Frogblog: Green MPs - group blog. #50 Blogs | Act NZ: - group blog: Roy, Douglas et al. #140 United Future | blog - Dunne & Party Pres. Most of the blogs are promotional rather than interactive (although they all allow comments). If you know of any more MPs with blogs please let us know in the comments section.